WANTED, TRUE OR FALSE – IS THE MARKET FOR RUSSIAN ART FORGERY BETTER VALUE THAN THE MARKET FOR THE GENUINE ARTICLE? 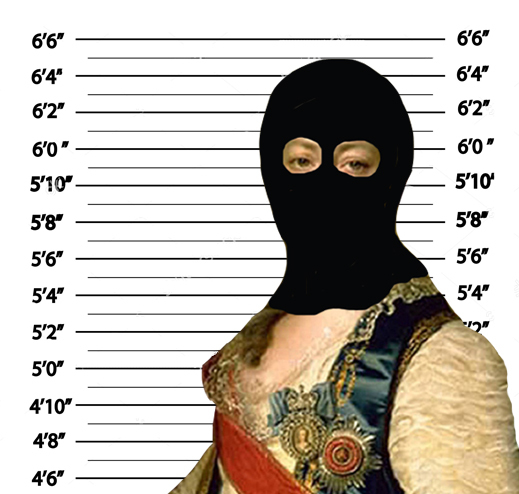 Faking of Russian paintings by forgers, certified by fraudsters pretending to be experts, is on trial in St. Petersburg and Wiesbaden, Germany, but until the verdicts are delivered, there is no certainty of value, no reliable pricing. Suspicious canvases are surfacing regularly in all the European capitals, including Moscow. But as the growth in market value of genuine Russian art slows to a halt, with the decline in fortune of Russian art-buyers, has the profit margin in faking become a better line of business to be in – if you are a seller? Post-19th century art is the best line to be in if you are forger, faker, and fraudster because the genuine materials – canvas, paper, brushes, pencils, and paints – are cheap and easy to get hold of. This is also because there has been less time for real experts to accumulate catalogues of real works, with demonstrable provenance – that’s provable ownership from the artist’s hand, to collector, to gallery wall. The destruction of the Russian civil war, followed by the German invasion, and the persecution of Jewish artists and collectors have provided cover stories for Israeli and other crooks to dig up, or otherwise discover Russian works never known to exist before – because they didn’t. 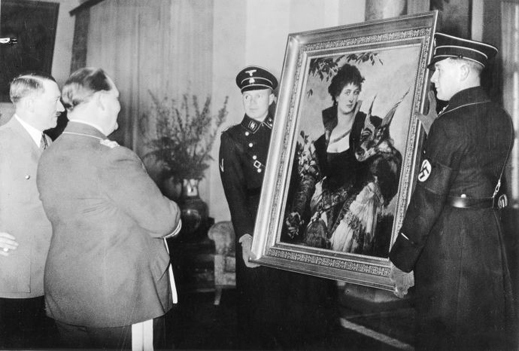 Adolph Hitler presents Hermann Goering with “The Falconer” by Hans Makart as a gift on January 12, 1938. The work, painted in 1880, was bought first by Hitler from art dealer Karl Haberstock. How much below market Haberstock asked as his price; what he had paid for the work himself, and to whom; and what Hitler paid Haberstock are questions not easily answered. Nor is whether the work was as genuine as Haberstock told Hitler, and Hitler told Goering. When thieves trade in art, forgers have plenty of camouflage. If the Markart had been faked, and Haberstock was conning Hitler, the current owner of the Makart, the Neue Pinakothek in Munich, had better double-check. Italians, French, British, Swiss, and Israelis have all worked out — many of them faster than Russians because they had a head-start before the Soviet Union collapsed – that what is needed to maximize profit is to corner supply in a commodity the market believes is scarce enough to pay a premium for. Russian art between 1900 and 1930 has been a lucrative corner of the market, because the artists had short lifespans, leaving poor trails of their works and what they did with them. This business – falshak it’s called in Russian – requires three people: the forger to produce the fakes; the dealer to market them for sale and collect the proceeds; and the expert to sign an authentication certificate verifying what he or she knows to be false. According to evidence given in a St. Petersburg court case now underway, “almost 70% of paintings in the art market by Russian artists of the first half of the twentieth century are fake.” For more details, see. If caught, the culprits may be arrested. But very few go to jail – almost none for as long as they would if they had stolen the equivalent in cash, cars, jewellery, or real estate. Sending the art-fakers to prison isn’t easy, for it must be proven that the expert wasn’t making a genuine mistake; that the seller intended to deceive the buyer; and that the work was in fact faked. And all of this evidence must be gathered before the statute of limitations runs out – that can be as little as 3 years in Russia and Germany; 5 years in France; 6 in the UK and US. 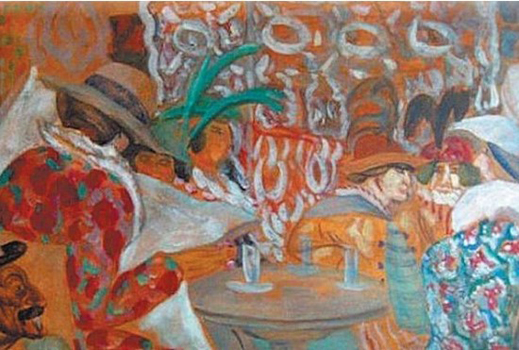 The prosecution of Elena Basner, a former curator at the State Russian Museum in St. Petersburg and expert on the Russian avant-garde, involves charges relating to a painting by Boris Grigoriev, apparently dated in 1913. After more than a year of testimony in the Dzerzhinsky District Court in St. Petersburg, there is little doubt it’s a fake. Basner has admitted most of the evidence of her attributions. She says she was paid $20,000 for authenticating the Grigoriev. For a summary in English of the case details, plus claims in defence of Basner that she has been set up by academic or business rivals, read this. At the latest court hearing on April 14, Judge Anzhelika Morozova complained at the prosecutors’ delays.“How long will the prosecution ask for the continuation of the case?.. At the next meeting we will resolve all issues related to the completion of the trial in the case.” For more on the hearing, click. Basner’s defence is that she erred innocently, and in good faith. Her past involvement in certifications has also spilled across the border, where the Fnnish authorities are investigating dozens of apparent fakes with Basner’s warranties attached. No charges have been filed there, yet. How many innocent mistakes can be made before they become provable fraud is the point still to be tested in both the courts of Russia and Finland. Left: Yelena Basner; right; German police display one of the alleged fakes in Wiesbaden. The Wiesbaden case involves three partially named Israelis who are accused of trading faked paintings by Kazimir Malevich, Natalia Goncharova, and Alexander Rodchenko. The Israeli press has identified the name of one of the accused as Yitzhak Zarig. Their dealing establishment in Wiesbaden was called SNZ. Reportedly, their take was €11 million. No evidence of the cost – forgery of the painting, transportation, storage, rent, payoffs to accomplices – has appeared. The mark-up is believed to have been about one-thousand percent (that’s 1,000%). More than a thousand works were confiscated by the German police as part of their investigation, which began two years before the arrests. The trial has not been completed, and there is no verdict yet. A source in Spain says he bought paintings by other Russian painters – Alexandra Exter (below, left), El Lissitsky (centre), and Nikolai Suetin (right) – from a dealer in Münster, Germany. It was later revealed the dealer got the works for sale on commission from SNZ in Wiesbaden. When the cheated buyer presented his demand to his seller for return of the money, the dealer declared insolvency. Although contracts between the Münster dealer and the SNZ gallery have been uncovered, the evidence of deliberate fraud is based on false information about the provenance of the works. When the dealer sold them to his mark, he didn’t mention SNZ as the source. That discovery took six years to make. Because of technological advances in detection, and because the US tested, then dropped the first atomic bombs on Japan in 1945, the presence or absence of caesium and strontium isotopes in artworks can determine whether they were produced before or after 1945. There are many other detection methods; this one was first proposed by Basner. Butterwick (right) concedes there is little knowledge in the market about how much forgers are paid, and what the mark-up is for falshak. The Wiesbaden case revealed the existence of forgery workshops, with records of who produced the fakes. Details of what these painters were paid are not available. Experts suspect the forger may get $5,000 per canvas; the expert $20,000 for an authentication certificate. But the work may start trading at $750,000, and keep rising until suspicion beats demand. “No self-respecting dealer would touch these things,” Butterwick says about works he’s certain could not have been produced by the purported artist. He acknowledges, though, that the profit incentive may be big enough to overcome self-respect. What if the relatives and friends of the dead artists calculate they can go on making profits for themselves by “enlarging” the supply beyond the catalogue? Chashnik, a student of Malevich, died in St. Petersburg in 1929 at the age of just 28. His son, Ilya Ilich, helped organize the first major exhibition of his father’s work outside the Soviet Union. That was at the Leonard Hutton Gallery in New York in 1979. Left: Ilya Chashnik junior in St. Petersburg with US friend and dealer, Lev (Lew) Nussberg; right: the Hutton catalogue of 1979. Nussberg’s subsequent dealings in works by Chashnik, Malevich, and Suetin have led to controversy and litigation. For details, read this. According to the Hutton catalogue and a current expert on Chashnik, there were no paintings in oil by Chashnik in the 1979 show. Can the artist have executed genuine oil paintings, and if he did, where have they been for the past 40 years? Last month in Paris the Tajan art auction-house offered for sale Russian works by Chashnik and El Lissitsky. 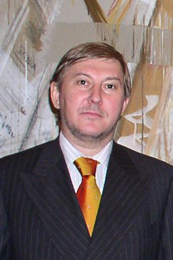 The Tajan dealer and specialist for impressionist and modern art is Caroline Cohn; the expert for authentication, Alexandre Arzamastsev. 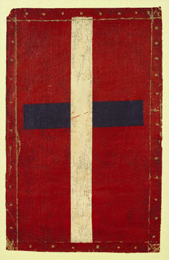 One of two Chashnik works for sale was this one (right), identified as an oil painting titled “Suprematist Cross”. There is a date for Arzamastsev’s recent certificate, but no date for the painting, and no record of its provenance. The price estimate by Cohn was between €18,000 and €20,000. Cohn says the works were sold on March 8. “We don’t have any other artworks by this artist for the moment,” she adds. She was asked to clarify “the provenance of the works you have just sold, and how do you characterize the seller (individual, institutional; Russian, non-Russian) and the buyer (same)? Finally, there is no recognition in Moscow of the name of your expert, Mr Arzamastev – what can you tell me about him?” Cohn refused to answer. The Chashnik case is far from unique in European modern art. The younger they die, and the more unrecognized and impoverished their short careers were, the easier it can be for their survivors – lovers, children, friends – to make discoveries of hitherto unknown work. There is the well-known case of Christian Parisot, for example, friend of the only daughter of Amedeo Modigliani; expert on the painter; and also President of the Archives Legales Amedeo Modigliani, and thus keeper of the catalogue of Modigliani’s works. Was he the faker and fraudster he was charged with being by the Italian police in January 2013? For the start of the case, read this. Along with Parisot (below, left) and his suspected accomplice, art dealer Matteo Vignapiano, the police seized 59 fakes including 41 sketches, 13 graphic designs, four sculptures in bronze and an oil painting. 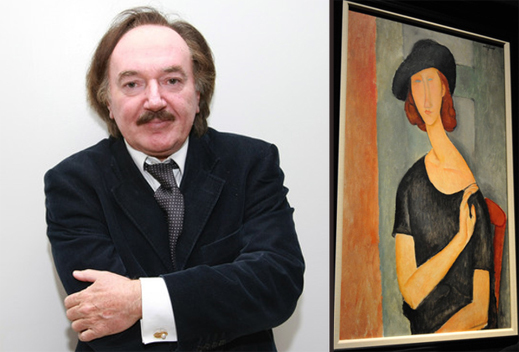 The Financial Times, the New York Times and other mainstream media reported the arrest, because of its impact on the multimillion dollar market in Modigliani works. There’s been no comparable report of the outcome of Parisot’s case, if it has ended. 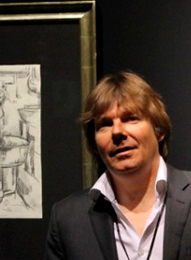 In May 2008, Parisot had been convicted by a Paris court, imprisoned, and fined for selling faked drawings by Modigliani of Jeanne Hébuterne, his partner. The tipoff to the police in that case came from Hébuterne’s great-nephew. But did the Parisot arrest in Italy five years later put a dent in the market for genuine Modiglianis? “There is no doubt,” claimed the New York Times days after the new charges were made public, “that the 1919 portrait of the Italian painter’s lover Jeanne Hebuterne [above, right] on sale at Christie’s is genuine. And Christie’s hopes that if anything, the clamour for genuine works by the Italian artist will have increased. Hence its upbeat predictions for the imminent auction of the key portrait.” That painting of Hébuterne was sold by Christie’s in February 2013 for £26.9 million ($42.3 million). Still, the profitability of faking is bound to stay ahead of the genuine article, for reason of the combination of volume and margin — the supply of fakes is unlimited, but because it is also controllable and low-cost, compared with the high-priced rarities, so the seller may end up making more money than the genuine trade. Another con is the forger who claims he’s an artistic genius whose only mistake was, not the faked painting, but the faked signature at bottom or back. 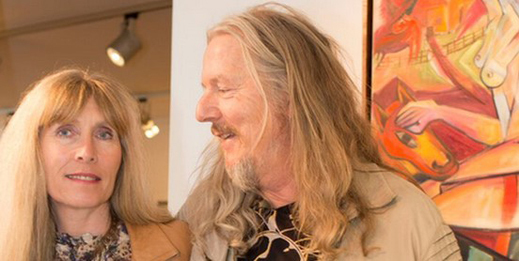 This is the case and claim of convicted German forger dealers, Wolfgang and Helene Beltracchi. “I was in prison not for the painting, but for the signature,” Wolfgang summed up. “I regret the wrong signature,” The pair did time for their “mistake”.